In one of my earlier posts, I had talked about effective email marketing for engineers and design professionals. I’m continuing the same topic in this post because email marketing is such a vast and important topic. Since publishing the previous post, there have been a few more independent research studies on manufacturing marketing that have been released. I’ll share some of those new findings in this post. 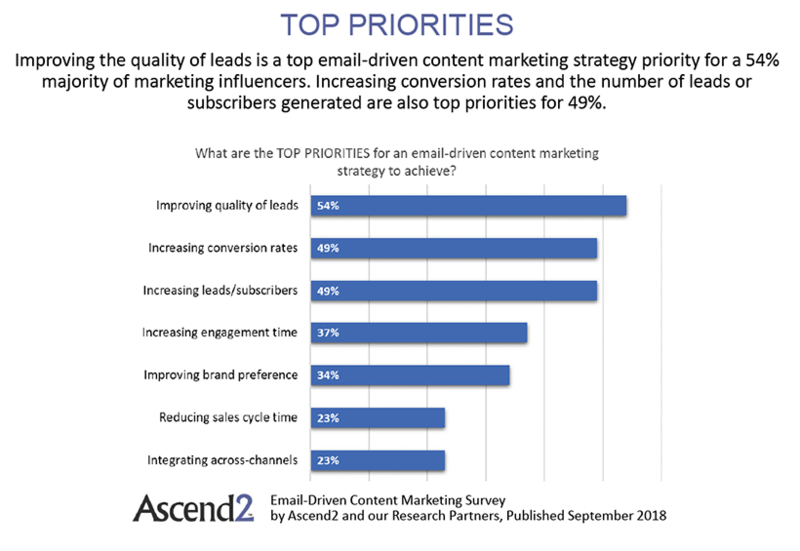 A current B2B marketing trend is using an email-based content marketing strategy for generating new leads and nurturing them into sales opportunities. What are the top priorities of such a marketing strategy? Look at this chart from the 2019 Manufacturing Content Marketing report published by the Content Marketing Institute. The numbers in parenthesis are the relative weightage for each of those components. Content and creative are things that you control. TraceParts can help you take your email campaigns to the next level by carefully selecting the right audience from our database of over 1.5 Million contacts registered on TraceParts CAD-content platform. Keep in mind, these are contacts who have opted to receive email information sent by TraceParts. You will not only be fully compliant with EU GDPR regulations, your email campaigns will reach a captive audience who wants to hear from you. We’ll help you filter the list by industry, company size, areas of interest and country. In short, you’ll get an email list that is a perfect match for your message. We’ll even help you track your email campaigns. This is the fourth component of email marketing. It is important because unless you measure, you can’t know what is working and what is not. I don’t want to make it sound easy or that all you need to do is send email campaigns to our list. There is a lot more that goes into effective email marketing campaigns. As mentioned, email content has equal weightage as the list. While it is true that “95% of engineers will consider an email in their Inbox, 50 percent of engineers scan for subject lines that intrigue them and delete the rest while 37 percent open most or all to scan for content or read every one.” (Sources: ENGINEERING.COM and IEEE GlobalSpec). Your email content must earn the trust of engineers and industrial professionals for them to actually read your emails and take action. If you succeed, they are likely to whitelist you and your emails will reach their Inboxes. If your in-house email list is small and you don’t have the resources to create your own email campaigns, then consider adding third-party e-newsletters such as the TraceParts eNewsletters in your email marketing mix. Our e-newsletters are delivered to 540,606 engaged subscribers worldwide and can expand your limited in-house lists. Text ads placed in e-newsletters are a great way to gain exposure for your company, its products and/or services. During the early stages of the purchasing decision, maintaining top-of-mind awareness is important for making it to the vendor shortlist. You could also use e-newsletters to promote your white papers and other technical content. This will increase the reach of your content significantly as compared to just publishing on your website and hoping your audience will find them. My team has published many helpful articles on email marketing that you’ll find here. I encourage you to read them to get a good overview of email marketing for component manufacturers. Supply us with your HTML file(s) and a desired launch date and we will do the rest!